We have been learning about life cycles at nursery.The life cycle process fascinated the children and they watched daily to record the changes. They learned how the butterfly uses it’s long tongue (proboscis) to drink the sweet juice from the flowers (nectar). The butterflies were released into the garden but we were lucky enough to see them up close. We experimented with the paint to learn more about symmetry. We were also very luck to obtain some frogspawn. Again the children were fascinated. They helped to look after the tadpoles by cleaning out the tank and feeding them with special food developing their awareness of what is required to help them grow and how they change over time. Helping to look after our tadpoles. (Dylan, age 4) ‘The frogs jump and ‘ribbet’. 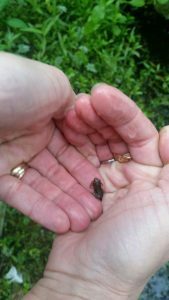 The tiny frogs were returned to the pond. Previous PostRiding of the Marches 2016Next PostPaint a picture…..
Imogen has been leaving sugar water in our garden for butterflies and bees. She really enjoyed the whole experience of the caterpillars and next year we will get our own.